OluFamous.Com observed that EFCC chairman, Ibrahim Magu, did not say the man has been paid his percent. He said "we are currently working on the man", that is to guide since he hasn't seen such a huge sum of money before in his life. 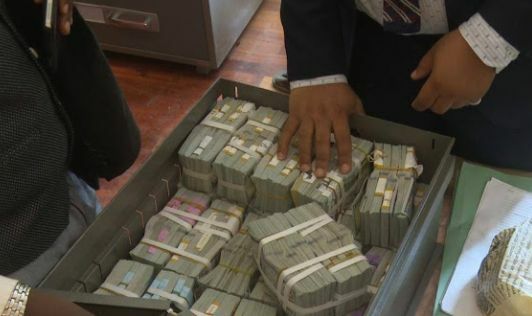 The whistle-blower who gave information leading to recovery of N13bn from flat 7B Osborne Towers, Ikoyi, Lagos, has denied having been paid five per cent of the recovered sum. A lawyer, Yakubu Galadima, who claimed to be counsel for the whistle-blower, alleged today that the Economic and Financial Crimes Commission has reneged on the promised 5%. A statement on Thursday by the spokesman for the EFCC, Wilson Uwujaren, quoted Magu as saying in Vienna, Austria, that the “young man” who blew the whistle had become a millionaire. “We are currently working on the young man because this is just a man who has not seen N1m of his own before. So, he is under counseling on how to make good use of the money and the security implication. The lawyer said he had already written a letter dated October 10, 2017, to President Buhari in this regard but had yet to get any response from the presidency.